Industry experts predict that successful businesses will soon become 100% digital for all transactions. The key challenge is how to “go digital” in the right ways. For most companies, it will be an incremental journey. TodaysGeneralCounsel.com suggests that organisations should focus on a broad enterprise-wide information governance strategy developed by IT, legal, records and business stakeholders. Doing so improves governance, risk management and compliance programs. 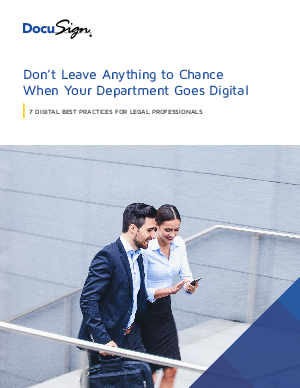 This best practices paper outlines seven important ways that legal teams can make meaningful progress in their digital transformations.